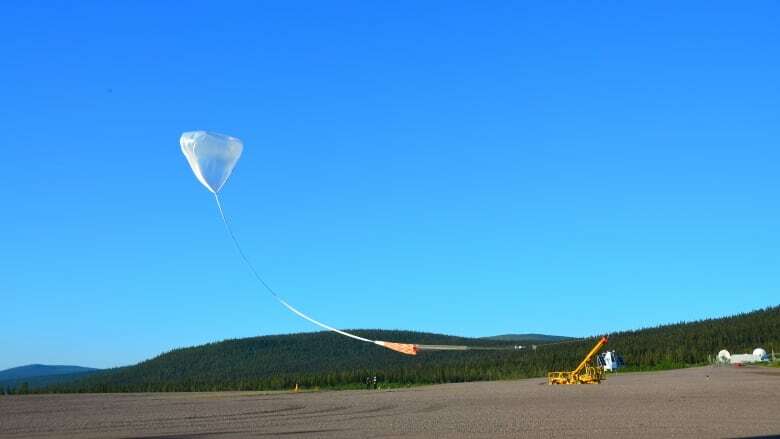 Swedish space agency retrieves research balloon near Ulukhaktok, N.W.T. Robert Kuptana of Ulukhaktok was excited when he found out that some guests staying at his bed and breakfast were Swedish scientists in town to do balloon research. Robert Kuptana from Ulukhaktok was excited when he found out that some guests staying at his bed and breakfast were Swedish scientists in town to do balloon research. "We thought they would be blowing up balloons in town and would be fun for kids, but it didn't happen that way." In fact, the scientists had arrived to retrieve a complex piece of equipment attached to a balloon launched by the Swedish Space Corporation in Sweden a week earlier. The enormous balloon was filled with one million cubic metres of helium and was designed to carry an X-ray telescope sitting inside what looks like a small spaceship, about three metres tall and weighing about two tonnes. Travelling the stratospheric winds, the balloon moved towards Canada analyzing Earth's atmosphere. It flew at an altitude of about 40 kilometres — four times higher than the average plane. The Swedish Space Corporation used the balloon mission to point a telescope at various astronomical objects, in particular neutron stars, to learn more about how they work. Mark Pearce, who heads the physics department at the KTH Royal Institute of Technology in Sweden, says "these are very peculiar objects which are extraordinarily dense." "To dig out a teaspoon of material from the surface of this star then you will find out that the teaspoon weighs about one billion tones." The scientists hope to learn more about the radiation these stars emit, where it comes from and how it's produced. Balloon research, Pearce says, is the most practical method of gathering this type of data, as long as travel to the stars — about 6,500 light years away — remains a distant dream. Pearce says they were lucky that they found the balloon. The scientists originally thought the balloon was closer to Cambridge Bay, but were able to track it nearer to Ulukhaktok and find the equipment relatively undamaged. At the end of the flight, a radio command sent from Sweden opens the balloon, allowing the gas to escape. As the unit begins to fall back to Earth, at a rate of 40 to 50 kilometres an hour, a parachute is activated to provide a smooth landing. They plan to return the equipment to Sweden to analyze all data gathered. "This will be new information which will be quite interesting in our research field," said Pearce. "Very nice to learn something new about this strange neutron star on the sky."